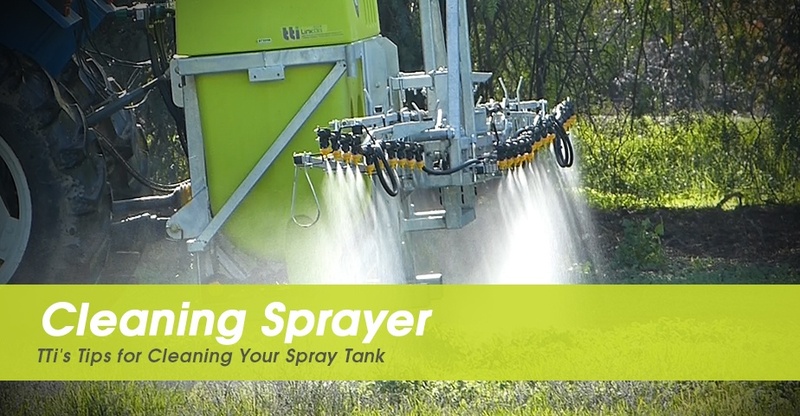 Cleaning your spray tank, whilst a tedious task, is incredibly important for your crop, the people working with the sprayer, and the longevity of your equipment. Removing pesticides and chemicals from mixing and spray equipment immediately after spraying will make cleaning your tank a much easier job. Spraying out or draining the remaining chemical, and then flushing out with clean water will take care of the majority of the cleaning. Once this is done, it is important to visually inspect all components of the sprayer to identify any parts that may need further attention. All areas of the tank walls must be washed with clean water. This can be done by hand, but for a quicker method, a wash-down nozzle works well. Similarly, the sump must be completely emptied and flushed with clean water. It may take a few repeat rinses in order to dilute the remaining chemical as much as possible. Any plumbing or booms attached to the unit can be cleaned by pumping water through, ensuring that all return and agitation lines are flushed out, too. Cleaning agents can be used if deemed necessary. Filters and nozzle bodies can harbour chemical – it is essential to clean these components separately and thoroughly. Rinsing with water, as well as using a small brush to carefully scrub, are good ways of cleaning filters and nozzles, however it is important to remove screens that may have been used with any chemicals. It is important to always spray/empty out the tank in the field, in a non-sensitive area and away from waterways. Cleaning and maintaining your spray equipment might not be the most enjoyable of chores, but doing it regularly can prevent frustration, save money and be of benefit to your crops.